Lauren Cooper has been doing calligraphy for the past six years and set up Oh Wonder in January 2016 after having her son. Over the past two years, she has taught hundreds of people the art of modern calligraphy. 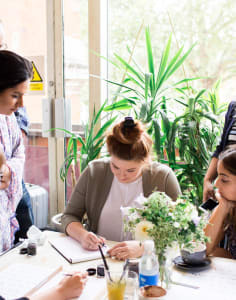 She teaches private lessons, group workshops, corporate events and has also taught large groups at The Handmade Fair and The Wedding Fair at Excel. Lauren runs Oh Wonder from her garden studio in South East London and works on a variety of commissions for weddings and events along with creating a variety of handmade coloured inks to fill a gap in the calligraphy market. Caligraphy class was really enjoyable. The venue that it was held in was great and the class itself was quite fun as well. Definitely need to have basic knowledge as most of the class is spent developing your own style. Would have liked a bit more one on one with the instructor and some direction as an expert. Great source of knowledge as well in regards to materials and inks and things. It's a nice experience yesterday, This is literally what I want to learn. In the workshop, Skills and use of tools are fully covered. I am highly recommended to every calligraphy beginners, it's an enjoyable 2 hours session.